Who knew awesome came in so many colors? 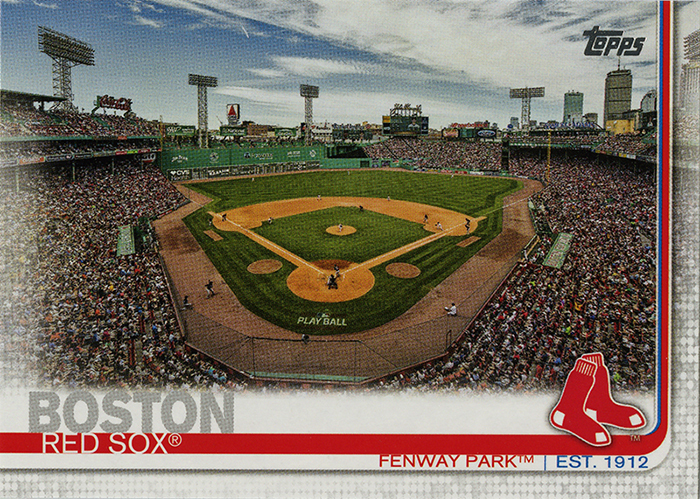 So, 2019 is off to a bit of a whimper for the Red Sox, and card collecting is more or less following suite. There’s not a ton of excitement in the first few products this year. The rookie class is weaker, the designers are weaker, and there are enough short prints and random variations to choke a goat with. Even my stalwart Gypsy Queens are rather underwhelming this year. Donruss however has been my one bright spot so far. They’re simple, they’re not expensive, and the collation is so good that in TWO blasters and a couple random packs I have about 85% of the base set. 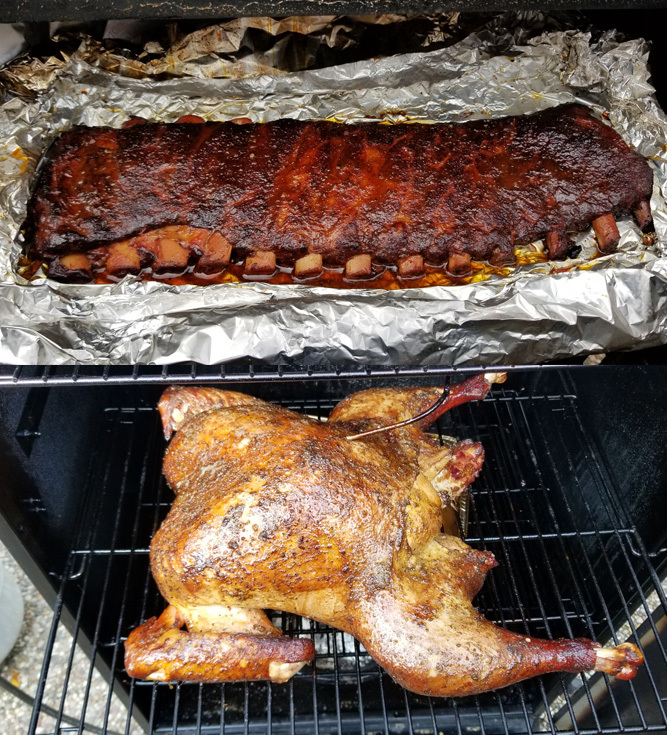 You can’t really beat that. I’m also in the minority of collectors since the lack of team names and logos doesn’t bother me in the least. 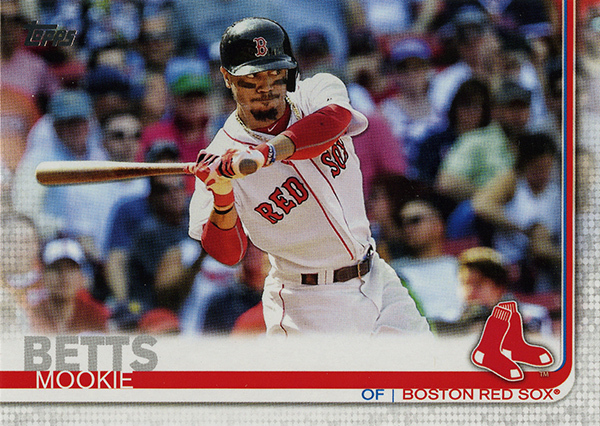 The Red Sox are well covered in the set, with a couple photo variations here and there, but also with a few well deserved inserts as well. 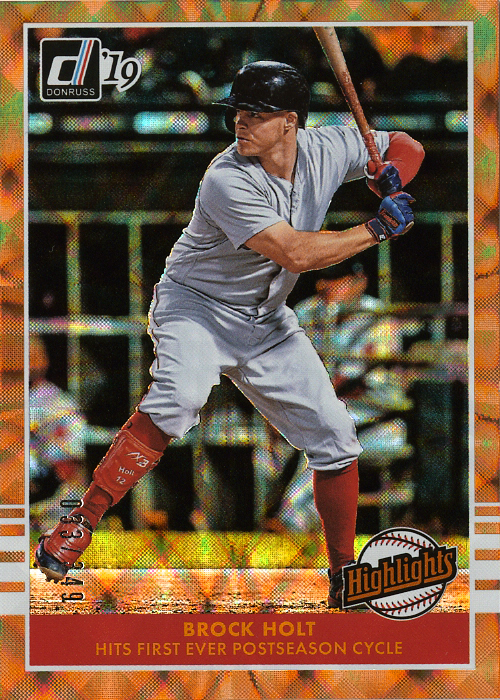 This brings me to just one of two Brock Holt cards to make an appearance in 2019. The other being Heritage. The trouble with Heritage is that the parallels are so short printed, the easiest to find ones (chrome) are starting at $15 on the secondary market. No thanks. I’m not paying $40+ for a semi-rare Heritage variation. Not happening. Instead I’ve decided to chase the Donruss rainbow. 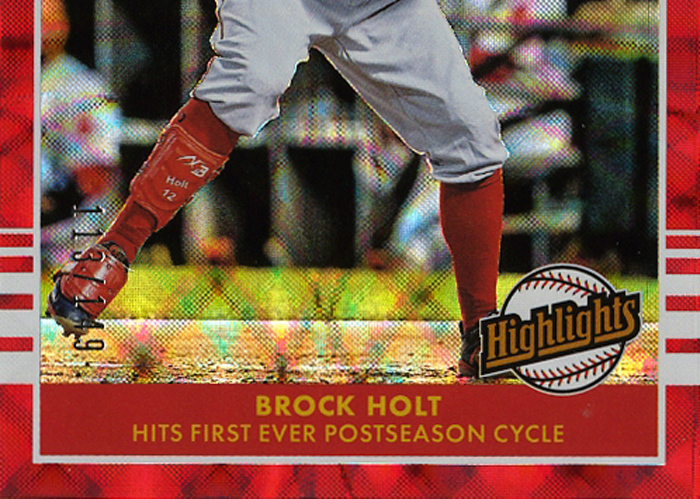 Holt has an insert card celebrating his post-season cycle game. There’s several variations with a couple being un-numbered and actually harder to find than their color/numbered counterparts. 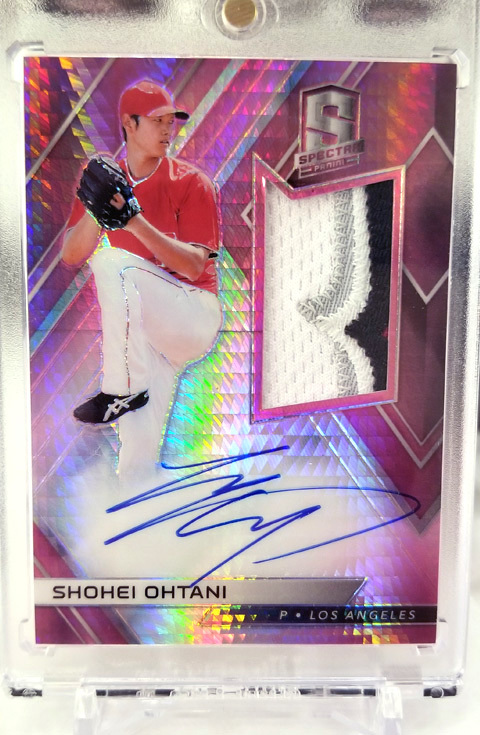 The checklists includes: Base (Silver) #/999, Diamond, Pink Firework, Rapture, Vector, Bronze #/349, Blue #/249, Red #/149, Gold #/99, Green #/25, Black 1/1. 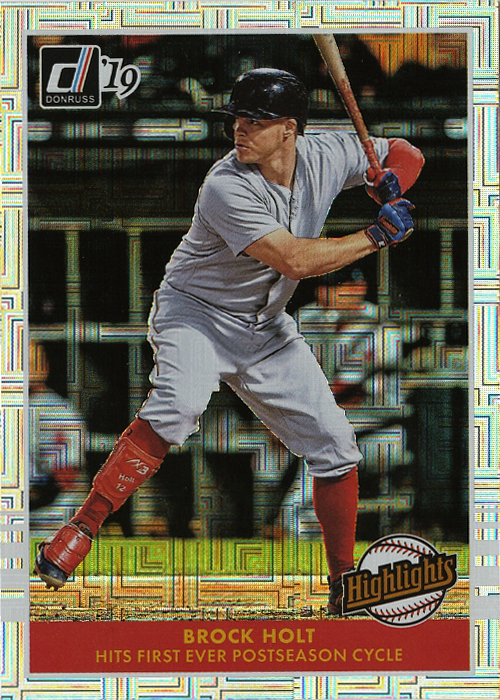 The Diamond, Rapture and Vector parallels are the hardest to find at the moment, with most believing they’ve been short-printed in favor of the colored parallels, or only available in certain packages (retail hanger packs, for example). That only leaves me with a couple more to go. I’m still looking for “Diamond” (a more geometric version of the base silver pattern) and “Rapture” (a small, sparkly diagonal line version) as well as Gold and Green. I have a Gold saved in the eBay app at $20, but I’m just waiting for the price to drop a little. I haven’t seen a Green appear in the wild at all. A fun little parallel rainbow is always a good chase, at least for me. Anyone else enjoying Donuss, or is everyone still not liking the lack of logos? It’s not going to come as much surprise that this breakdown took all of 20 minutes. 1970’s Topps isn’t exactly known for it’s intricate design. I mean, a grey box doesn’t really need to be “broken down”. That said, I figured I’d at least take a look at the fonts and try and nail those down. At least that way I can share with those of you who like making your own customs, and I can have them in my back pocket for doing a “Heritage-esque” card later on. So, what are we dealing with? For starters, two classic fonts with long lineages and one more whimsical one for the names. Up top, for the team names, you’ve got the always classic Franklin Gothic, with what I’m thinking is the Condensed variation. At the bottom, for the player position, a version of Futura called No.2 D, and the Bold version at that. The name was slightly trickier, but I’m 98% confident it’s Kaufman BT Bold. It could also be “Cafe Script”, they’re very similar, but I’m sticking with Kaufman. After that, it’s really just boxes, grey, and a nice photo. The grey looks to be #BFB6A7, at least in my monitor’s color profile. That’s really all there is to this one. A nice simple design that we can build on for something truly custom down the road. What if I could automate a gallery? I love solving problems (even non-existent first world ones) with technology. I had taken a look at the woefully out of date pages on my site the other day. I hadn’t update a needs/wants list since 2015, I hadn’t updated a trade-bait cards list since 2012. It was pretty sad. What’s the old saying? “The cobblers children have no shoes”? Well, the web guy doesn’t have time to update his own site. 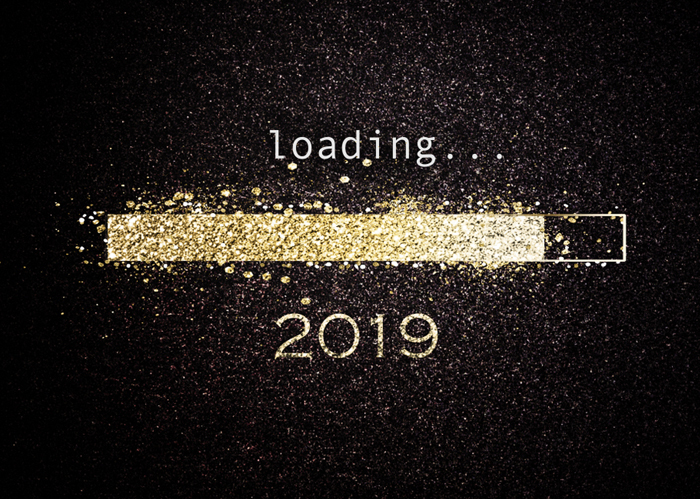 I’ve built 4 sites in two months so far in 2019, but I can’t seem to find the time to update a list. So, I had a thought. 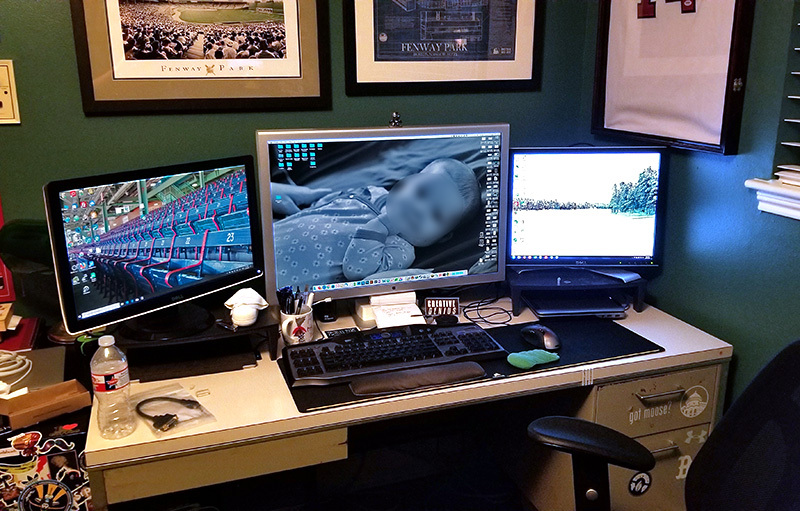 What would be the easiest way to have something, essentially, update itself with minimal interaction and effort? What if I could create a gallery of Trade-worthy cards using a few off-the-shelf plugins and scripts? 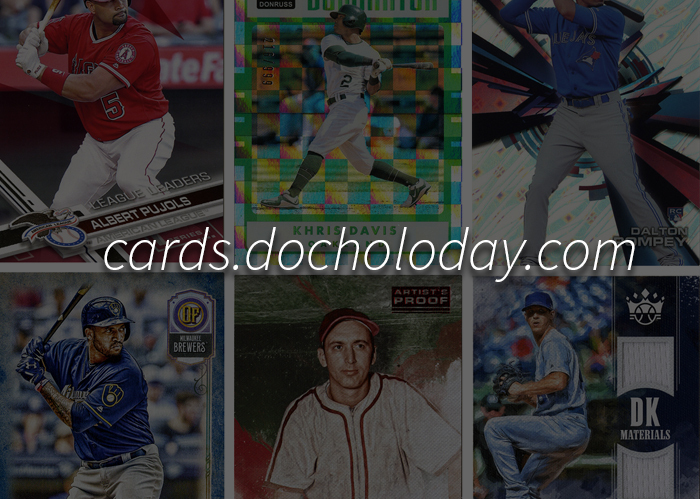 Edit: I actually updated my Cards page after I liked the results… Click Here. I need to say up front that this is a TEST of the technology, not a full blown implementation. Here’s the jist. On the server, within a defined “gallery” folder, I’ve created 30 sub folders. One for each Major League Baseball team. In those, I drop scans of cards. I’ve made the scans with a photoshop action that crops, resizes and saves anything I have in my “marquee” tool. I have the tool set on a fixed size (2.5x3.5). I scan an entire scanner bed of cards, click once on the card, click the action button, and done. 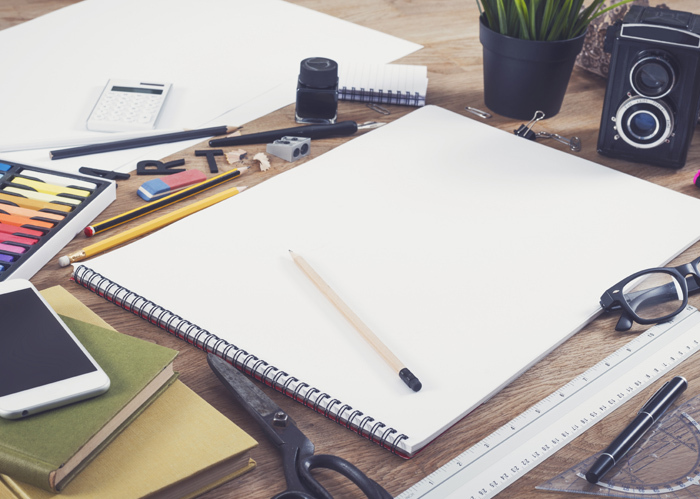 Saving with a useful name is about the longest part of it. Then I use an FTP program to just drop them into the 30 folders. That’s it. No editing pages to update galleries, no painful WordPress short codes to change. Heck, theres not even “pages” technically. So, with this little experiment, I took a handful of cards I had sitting around (not and exhaustive inventory of everything I have) and tried it out. It seems to work pretty well. More cards load as you scroll on the “all” category. It’s sortable by teams if you have a specific interest. The images open larger in a lightbox. And I feel like all I did was drop files into a folder. 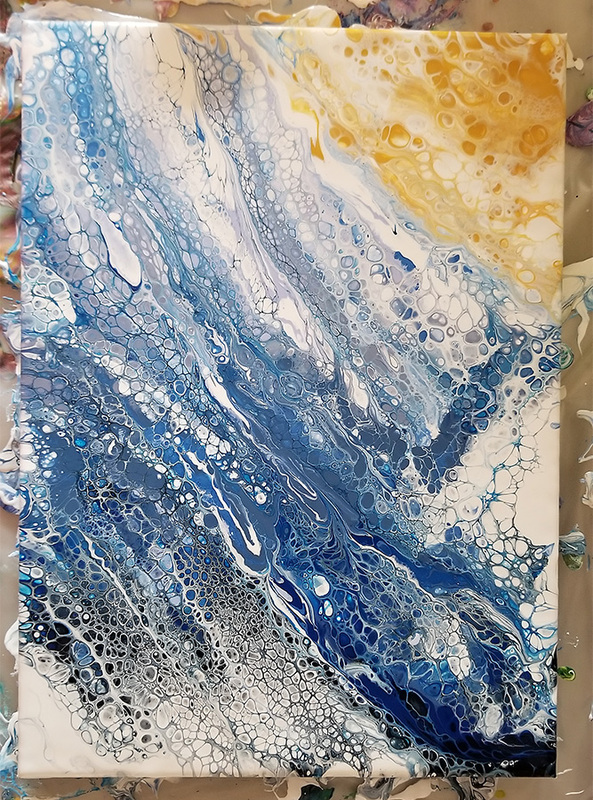 Again, this was just a test. A theory. Since it seems to be working, I have a feeling I’ll be porting it back to this site and integrating it here. Until then, please check it out and let me know what you think. I can answer any questions about it as well for those of you that have WordPress blogs as well. This checklist is a raging dumpster fire. 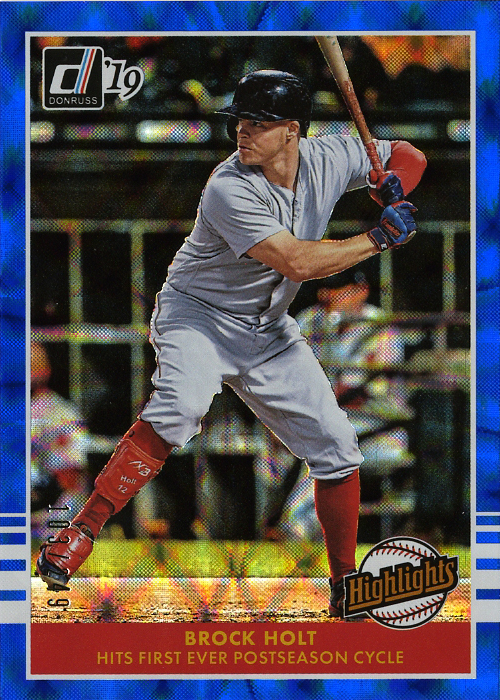 I should say upfront, there’s nothing really “wrong” with Topps flagship this year. Eduardo Nunez, David Price, J.D. Martinez, Mookie Betts, Rick Porcello, Xander Bogaerts, Jackie Bradley, Rafael Devers, Mitch Moreland, and Steve Pearce. That’s 10. Not 17. 7 extra cards with little to no purpose. “But wait, those are celebration cards for the World Series!” you cry. Are they? Are they really? They sure look a lot like base cards with a logo slapped on it. J.D. 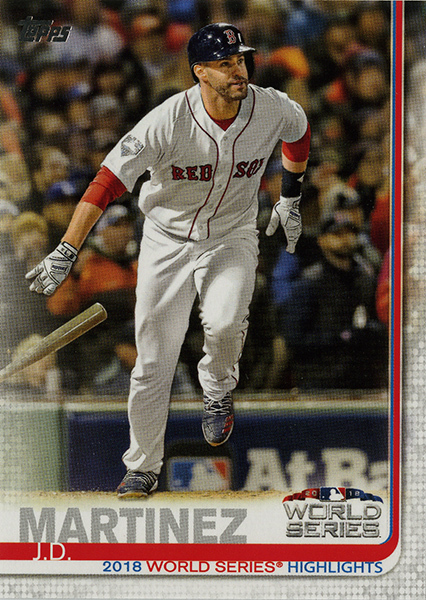 Martinez’s card for instance, has him batting, pre-swing. His World Series card? Dropping the bat post-swing and a WS logo in the corner. The base cards aren’t even really my problem. I’m ok with 10-17 of them. I would have liked fewer repeats, but I’d be willing to live with it if it weren’t for the damn inserts in this cluster of a product. 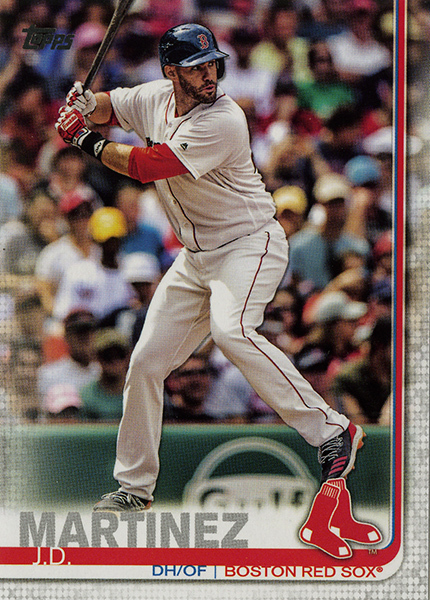 There are SEVEN (of the 10) base cards with SP photo variations. There are SIX “1984” cards, because we haven’t beaten that to death yet? There are FIVE “Grapefruit League” inserts, because no one remembers Ted Williams so we’ll remind you he played in the minors? There are FIVE “Greatness Returns” inserts, because inserts. There are FIVE completely pointless “Iconic Card Reprints”, because why try something new when we can put in reprints? There are SIX “Stars of the Game” inserts. I haven’t even counted parallels, relics, autographs or manufactured crap. Seventy freaking base and insert cards is nuts. Completely bonkers. You know who I feel bad for? The Yankees. (I hope I never have to type that sentence ever again). They have, and I’m not exagerating, ONE HUNDRED AND THIRTEEN cards that I would consider a base or insert card. Holy crap. 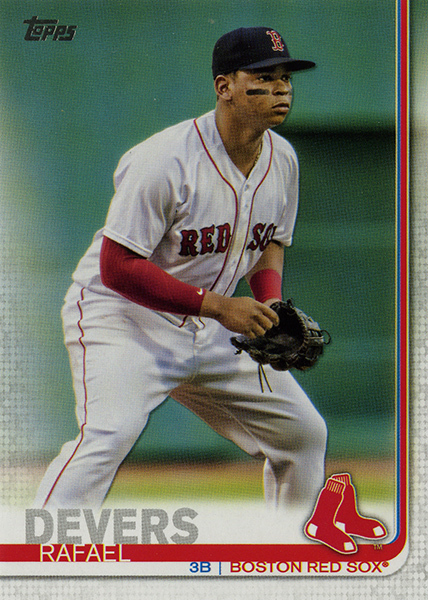 There are 37 Gleyber Torres cards alone, mostly due to a special insert set just for him. At this point, I have to honestly wonder what the product managers at Topps were thinking. Were they lacking material and didn’t want to make a “small” set so they over compensated? Were they inspired by the “150 Years” anniversary and got carried away? Were they trying to make the product more interesting because it’s always a weak seller and people usually wait for Series 2/Update to spend more on chasing rookies? I have no answers for any of that, except to say that I’m personally not falling for it this year. This will the first year in my 8 years back in the hobby that I will refuse to collect a master team set. I’ve got my 17 base cards, which I’m fine with, and if anyone wants to dump pointless inserts at me, I’d take them, but I’m not going to go out of my way to find, pay for or collect any of the additional 50+ cards. I just can’t get behind this idea that they needed to over saturate the product with cards no one will ever card about. 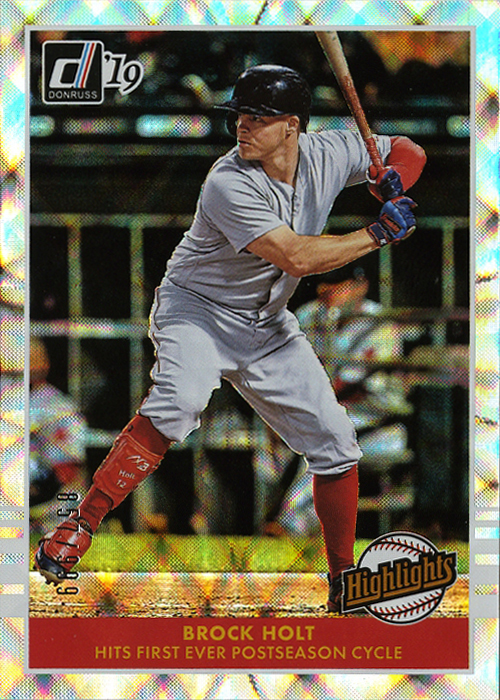 Do we want minor league cards of people that have retired and/or died? Babe Ruth, according to Baseball Reference (https://www.baseball-reference.com/register/player.fcgi?id=ruth–002geo) was on, but never played a game for, two “International League” teams in 1914. By all accounts, he went strait to Boston in 1914 and played 5 games. 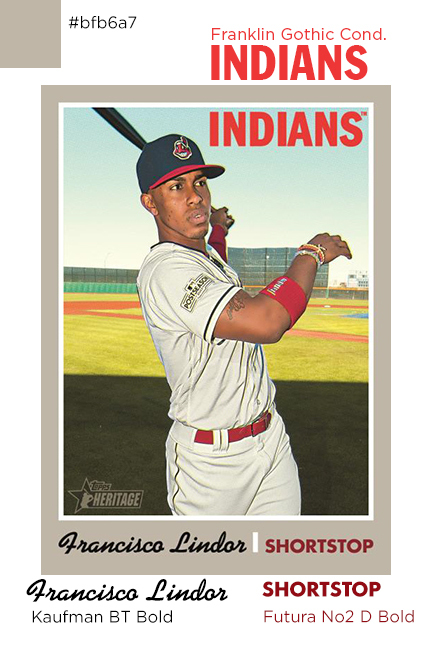 So, for Topps, that means he should get a “Grapefruit League Greats” card? For a league that didn’t technically exist? He was in Baltimore and Providence RI. That’s not exactly south Florida! I just don’t think this product was well thought out. Normally I’m super excited about the return of baseball, the start of spring training, etc, but I found myself staring at the boxes in Target over the weekend and I just couldn’t buy any of it. I had read the checklist ahead of time. There’s not a single other card (rookie or star player) from the larger set that I would want. 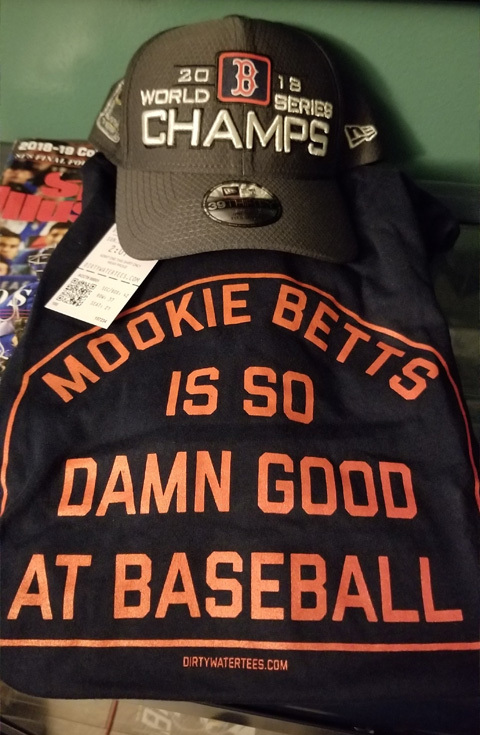 I suppose I’m just not going to buy any this year, which is a shame, because my love for baseball is stronger than ever. With the retail exclusives continuing to be a problem and checklists like these, I can see this being a very lean year for my card buying. Again, I don’t have a problem with the design, I think it’s fine. It’s certainly better than a few of the previous years, last year especially.